Attention senior citizens! It’s time to grab your friends for a fabulous night out at our 12th annual Senior Citizen Prom for It’s a night of dining, dancing, and a chance to win some pretty awesome door prizes. You could also be voted as this year’s king or queen! This year’s theme is “The 50’s”. Attendees are encouraged to get come in their leather jackets and poodle skirts. The prom will be on April 28, 2018 at the cafeteria of East Noble High School (901 South Garden Street, Kendallville, IN 46755). Prom is from 6PM to 9PM with doors opening at 5:30 p.m. Tickets are $10 each. You must be registered by April 13, 2018. Send all names, address and phone numbers of those attending with your payment to 1599 Lincolnway South Ligonier, IN 46767. Make your checks out to the Community Foundation of Noble County with P.U.L.S.E. PROM in the memo. 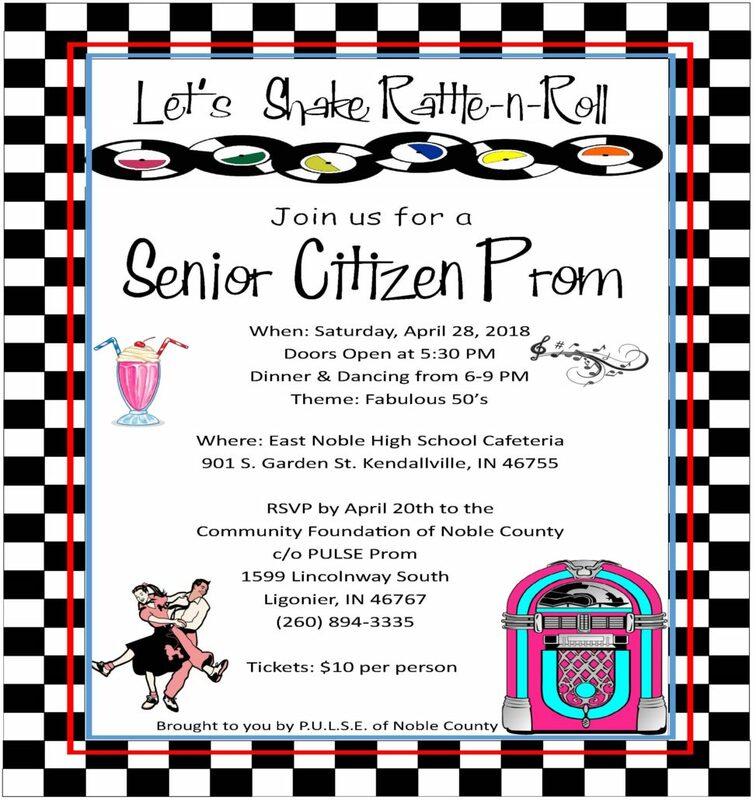 The Senior prom is hosted by the P.U.L.S.E of Noble County (Philanthropists Utilizing Lifelong Service and Education). As one of their many community service projects, P.U.L.S.E. members continue to offer the prom each year in hopes of bridging generation gaps. P.U.L.S.E. members decorate the facility according to the theme each year (in this case, a 50’s theme), take individual photos of guests, provide a full dinner and dessert, provide live entertainment and music from the FORDS, and hand out lots of door prizes for many attendees. Special favors for each are also provided, and the P.U.L.S.E. members encourage seniors to dress in their 50’s attire, although it is not mandatory. Please join them for a very special evening. Even if you do not dance, it is always fun to listen to great music, dine and watch the others, as well as spending time with friends and a chance to win prizes. If you have any additional questions, please feel free to contact Margarita at the Community Foundation of Noble County at 260-894-3335.
https://cfnoble.org/wp-content/uploads/2018/03/2018-Poster-pulse-prom-.jpg 2550 2409 Jennifer Shultz https://cfnoble.org/wp-content/uploads/2017/02/nccf_logo-1.png Jennifer Shultz2018-03-20 14:00:512018-03-20 14:01:14Senior Citizen Prom!